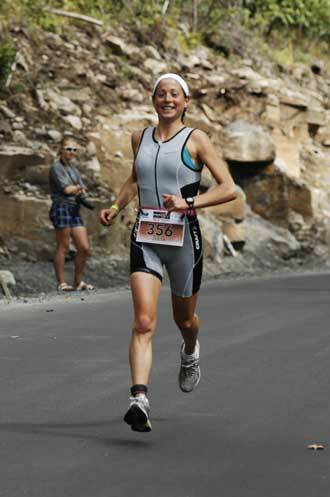 Julia Reichert placed first in her age category at an Ironman 70:3 in Muskoka, Ont. in September. The victory qualified her for the upcoming Foster Grant Ironman 70:3 World Championships in Florida. Photo courtesy ASI Photo. Don’t bother asking Julia Reichert what she does in her spare time. She doesn’t have any. In addition to her studies and the time spent at the two jobs she holds down, the fourth-year Chemistry undergrad devotes up to 25 hours per week training for triathlons. The 22-year-old Kirkland resident is preparing to compete in the Foster Grant Ironman World Championship 70.3 in Clearwater, Florida on November 14. 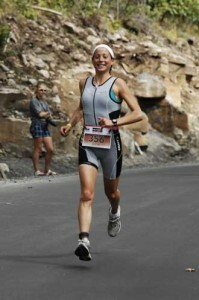 She qualified for the Championships by winning an official Ironman event in Muskoka, Ontario this summer. Ironman 70.3 competitions are essentially half triathlons. Competitors must complete a 1.2-mile (1.9 km) swim, followed by a 56-mile (90-km) bike, and finish up with a 13.1-mile (21.1-km) run. Reichert competed in her first triathlon just over a year ago and quickly fell in love with the races – and the training too. A self-described running fanatic, she first took it up after she stopped competitive synchronized swimming about four years ago. Reichert, who runs a synchronized swimming club in Beaconsfield, also works in McGill’s Wow lab, a two-year old initiative led by Prof. Brian Alters that promotes math and science in elementary and high schools. Reichert has even incorporated her Wow job into her triathlon training routine. Weather permitting, she bikes from her home in Kirkland to McGill and back – something that adds another two hours or so per day to her training regimen. Overall, Reichert estimates that she spends between 20 and 25 hours training every week, most of it running or cycling. “I have a pretty strong swimming background so I spend less time on that – about 90 minutes a few times a week,” said Reichert, who, like many other competitive athletes follows a day of hard training with an easier one. She runs five or six days a week, capped off by a two-to three-hour run of about 25 to 30 kilometres on Saturdays. On Sundays, she cycles for three or four hours. So how does Reichert juggle all that training with school and two jobs? Reichert is working extra hard these days preparing for her trip to Florida, but also says that she’s really going for the experience. Reichert, who is looking into Master’s Degree opportunities after she graduates next spring and is also hoping to pursue a teaching degree outside of Quebec at some point, already knows what she wants to do next in the triathlon world. She’s already registered for a full (140.6) Ironman race in Lake Placid, New York next July.